Citi--which in the year-earlier period logged a $4.7 billion charge tied to its brokerage joint-venture Morgan Stanley Smith Barney--reported a profit of $3.23 billion, or $1 a share, compared with a profit of $468 million, or 15 cents a share, a year earlier. However stripping out one-time items and debt valuation adjustments--which are charges or gains the bank books in relation to the value of its own debt--per-share earnings were down at $1.02 from $1.06. Revenue rose 30% to $17.88 billion, but dropped 4.9% on an adjusted basis to $18.22 billion. Analysts polled by Thomson Reuters recently expected per-share earnings of $1.04 on revenue of $18.62 billion. Central banks have begun making contingency plans on how they would keep financial markets working if the U.S. defaults on the world’s benchmark debt. Policy makers discussed possible responses when they met at the International Monetary Fund’s annual meetings in Washington over the weekend, said officials who spoke on condition of anonymity because the talks were confidential. The discussions continued as policy makers headed home. Senate Majority Leader Harry Reid, a Democrat, and his Republican counterpart, Mitch McConnell, ended a day of constant talks with optimistic proclamations, as details leaked out of the pact they were negotiating. "We&apos;ve made tremendous progress," Reid said at the end of a Senate session during a federal holiday, underscoring the urgency of settling a fiscal crisis that was nearing a Thursday deadline. The U.S. Treasury Department estimates it will reach a $16.7 trillion borrowing limit on October 17. "We hope that with good fortune ... that perhaps tomorrow will be a bright day," Reid said, hinting at the possible Tuesday announcement of a bipartisan Senate deal. A U.K. investigation into potential manipulation of currency markets is looking at a former trader at Royal Bank of Scotland Group who participated in electronic chat sessions with traders at other banks, according to people familiar with the investigation. Richard Usher, currently J.P. Morgan Chase&apos;s London-based head of spot trading for Group of 10 currencies in the region covering Europe, the Middle East and Africa, took part in the chat sessions with top traders from various financial institutions when he was an employee of RBS, these people said. The group of traders in the chat rooms was known by various monikers including "The Bandits&apos; Club," and "The Cartel," the people said. Fama, 74, has argued that financial markets are efficient and that stock-price movements are unpredictable, making it impossible for even professional money managers to gain an advantage. His conclusion that investors would be better off in low-cost funds that track the market’s performance helps explain the success of Vanguard Group Inc., the biggest U.S. mutual-fund company, as well as the rise of passive investments, which had more than $2.6 trillion in U.S. assets between exchange-traded funds and mutual funds at the end of 2012. Spirit Lake City Council Member James "Jimmy" Brown is facing two misdemeanor charges of Indecent Exposure and Battery. The Kootenai County Sheriff&apos;s office is investigating the alleged incident between Brown and Eric Vangemert, a Spirit Lake resident. Court documents accuse Brown of having a physical confrontation with Vangemert and exposing himself to Vangemert&apos;s wife and saying, "This is what a real man looks like". Investigators say the confrontation happened outside Joe&apos;s Hole, a Spirit Lake tavern and grill. In court documents Brown denies ever getting physical with Vangemert. Brown also told investigators, "That guy had one sole purpose in mind and that was to get me in trouble". KHQ spoke to Vangemert over the phone on Monday and he admits to calling Brown a vulgar name but believes this was an "unprovoked" fight. Vangemert also told KHQ that the fight, he believes, stems from an incident between he and one of Brown&apos;s friends several years ago. According to court documents Brown asked Spirit Lake Police Chief Gene Marquez if he was "exempt from the law because I&apos;m a city council member." A statement which Brown denies he exactly said. Orange-juice futures fell Monday after U.S. retail sales of the breakfast beverage dropped to their weakest level in at least 15 years. Americans bought just 563.2 million gallons of the beverage in the year ended Sept. 28, according to Nielsen data. That is the lowest since 1998-99, the oldest data available. Analysts have said a greater variety of beverages, including acai juice and energy drinks, have taken market share from orange juice, whose retail prices have soared. Jon Corzine and the team of executives who toppled commodities brokerage firm MF Global don’t deserve another $10 million of insurance monies to pay their already “exorbitant” legal bills, a bankruptcy administrator said. Corzine, the disgraced former MF Global CEO and New Jersey governor, wants the $30 million defense-fund cap lifted, but the court-appointed administrator responsible for liquidating MF Global Holdings Ltd., the brokerage firm’s parent company, is fighting the move. While the money would come from insurance, it could reduce distributions to other creditors, bankruptcy experts said. ...there is an almost bizarre disconnect between the headlines and what the people who matter — the investors, analysts, board members and, yes, even regulators — are seeking. None of them want him fired. A Dodgers fan dressed as a bear danced a jubilant dance atop the Cardinals’ dugout during the 8th inning of Game 3 of National League Championship Series Monday night. The bear&apos;s time in the spotlight was brief - video captured shows the bear up on the dugout for about 20 seconds before being pulled off by security - but certainly memorable. The furry fanatic got some big air and busted more than just a move, working in a cabbage patch and two jumping splits before being yanked off the dugout stage. The Dodgers got an insurance run in the inning, prompting some fans on Twitter to give birth to the hashtag #RallyBear. 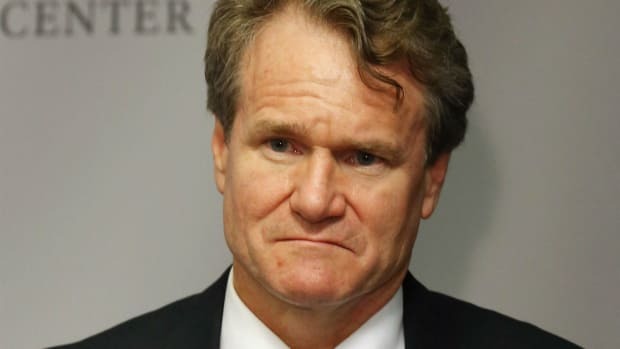 Brian Moynihan is feeling glum again; tax lawyers are licking their chops in advance of tax reform; wherefore art thou, buybacks? ; beware the dreaded coywolf; and more.